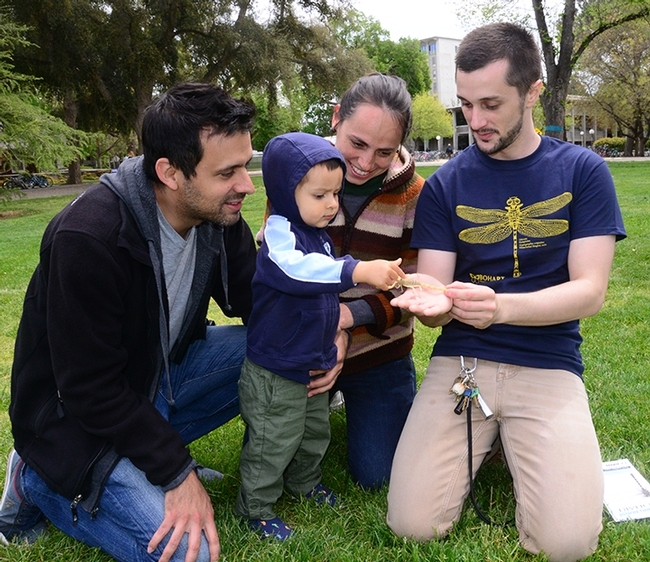 Well, UC Davis officials and the UC Davis Department of Entomology and Nematology did! 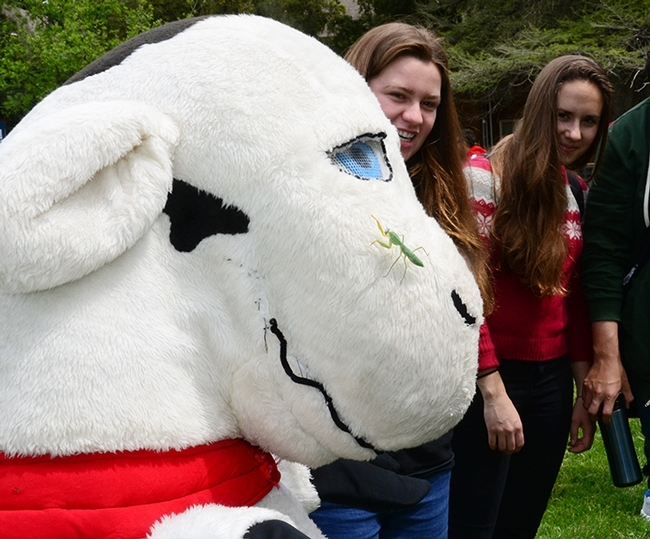 All systems are "go" for the 104th annual UC Davis Picnic Day, an all-day event on Saturday, April 21 when scores of visitors, aka picnickers, will stroll the campus. It promises to be both educational and entertaining. The UC Davis Picnic Day Committee offered a pre-view Thursday noon at the Quad. 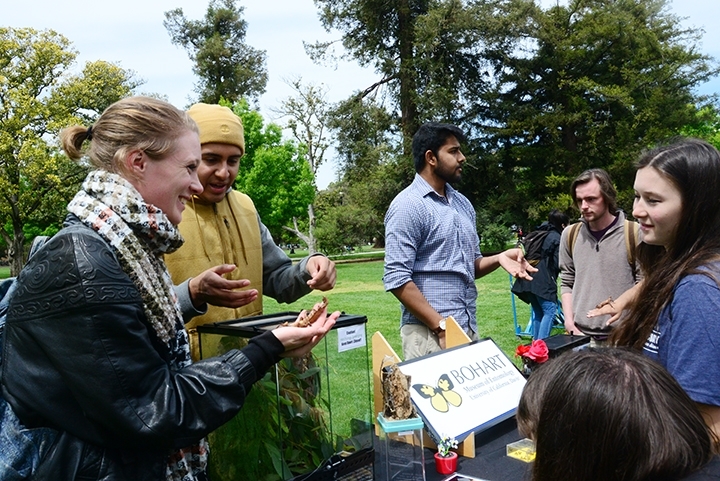 Bohart Museum of Entomology representatives--Wade Spencer, Lohit Garikipati, and Diego Rivera, all UC Davis students and Bohart associates--kept busy answers questions about scorpions, stick insects and praying mantids. Spencer displayed his desert hairy scorpion named Celeste. Okay, surprise, surprise! Celeste turned out to be a male, but his name remains Celeste. 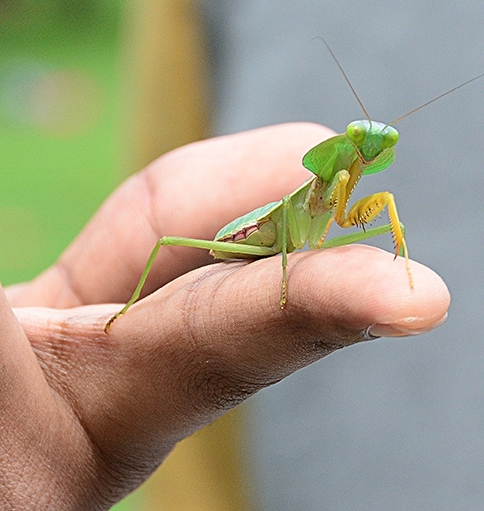 Lohit Garikipati, an entomology student who rears praying mantids, came with his buddy, a Malaysian shield mantis. "What's that?" visitors asked, looking at the shield. For a hour, the trio entertained the guests. 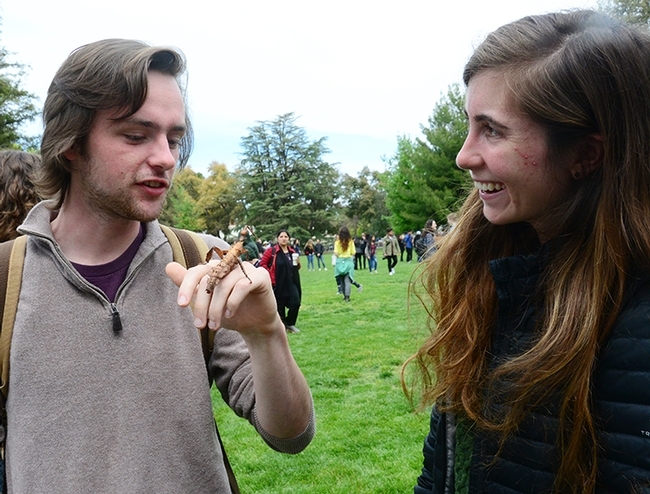 Some expressed awe at Spencer casually holding a scorpion. "I've been handling scorpions since I was three," he said. "I've never been stung." 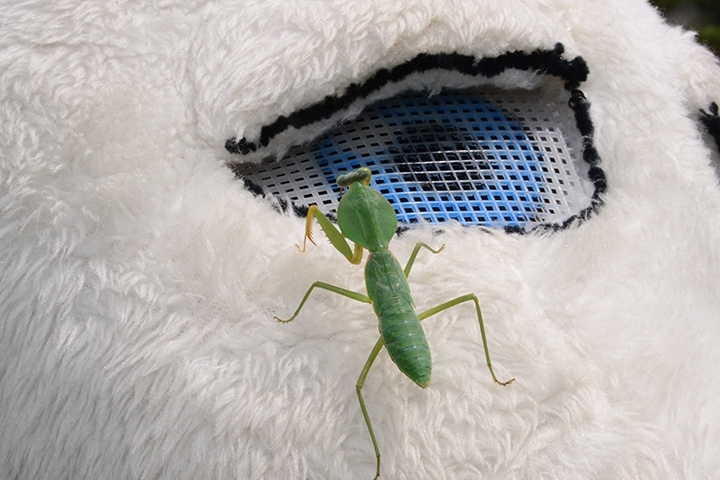 Rivera showed an Australian leaf walking stick insect that resembled a leaf. The crowd took turns holding and photographing it. 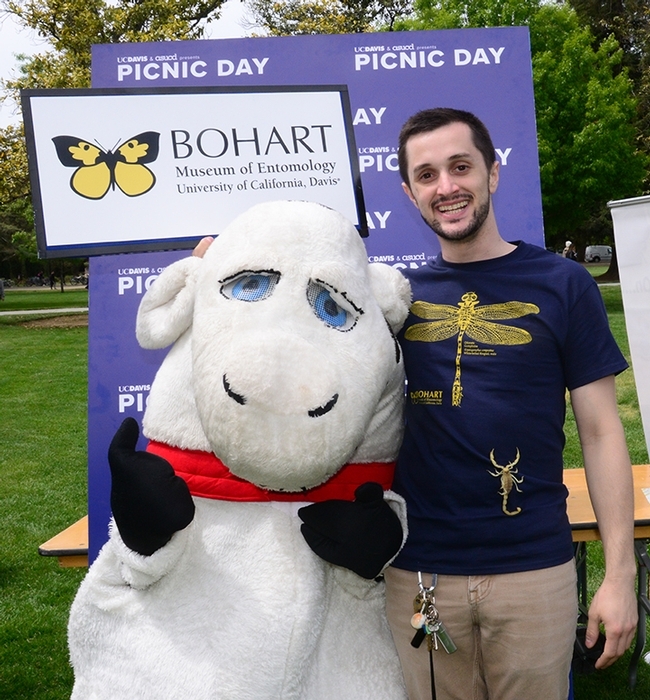 On Saturday, April 21, during the campuswide Picnic Day, you can engage with insects at both Briggs Hall, which houses the Department of Entomology and Nematology administration and most of the faculty, and the Bohart Museum of Entomology, home of eight million insect specimens. 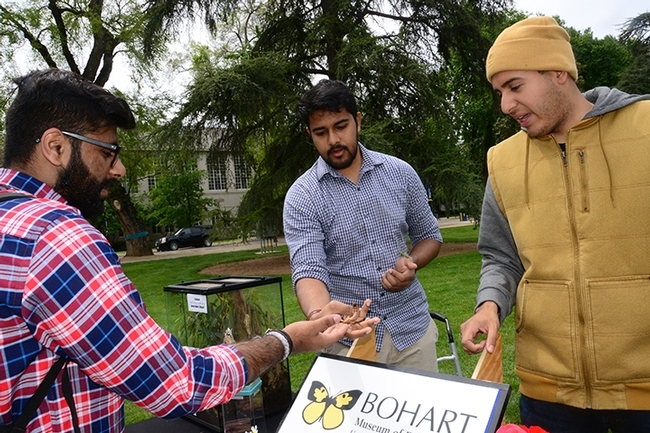 At Briggs Hall, located off Kleiber Hall Drive, activities will take place from 9 a.m. to 4 or 5 p.m. At the Bohart Museum of Entomology, located in Room 1124 of the Academic Surge Building on Crocker Lane, the open house is from 10 to 3 p.m.
Honey Tasting Booth: Extension apiculturist Elina Lastro Niño and her staff will operate the honey tasting booth, focusing on berry honeys. They will offer these honey varietals: blackberry, blueberry, raspberry, snowberry, almond and buckwheat. Scavenger Hunt: Participants will search for and identify insects in a display of 10 drawers in Briggs 122. Strike Up the Band: Music composed by Michael Lewis Bollinger (Frank Zalom lab); cover songs possible. The band, dressed in insect costumes, will include Jackson Audley of the Steve Seybold lab, rhythm guitar; Yao Cai of the Joanna Chiu lab, drums; Christine Tabuloc of the Chiu lab, vocals; Zachary Griebenow of the Phil Ward lab, keyboard; Wei Lin of the Brian Johnson lab, bass; Jill Oberski of the Phil Ward lab, tenor saxophone; and Brendon Boudinot of the Phil Ward lab, bassist. The Bohart Museum will also showcase its live "petting zoo," comprised of Madagascar hissing cockroaches, walking sticks or stick insects, tarantulas and mantids. The museum also offers a year-around gift shop with T-shirts, jewelry, posters, books, insect nets and the like.